The French might be a few steps ahead of us, but there are ways that your business can improve taking care of overworked employees. Baby steps can make a huge difference in moral and creativity, so listen up! Problem #1: According to the Glassdoor Q1 2014 Employment Confidence Survey, 22% of employees report receiving no vacation or paid time off. Solution: If employees at your company fall into this pool, then revisit your employee handbook. How long do employees have to wait until they receive vacation time? If it’s long enough for them to be really frazzled and start complaining about your lack of humanity, then it’s too long. You don’t have to go crazy. I assure you that an employee would get excited about three vacation days a year if they were expecting zero. Everyone needs a personal day! Besides, new employees are generally employees that you can live without for 48 hours. Problem #2: The Glassdoor survey reports that of those employees who do receive paid time off, 15% still don’t take any. And oftentimes those employees who are taking some vacation days aren’t taking nearly enough. On average, employees took 51% of their available time off this past year. Openly encourage employees to take time off. Give regular updates of remaining vacation hours and approach employees who haven’t taken any time off in the last year. 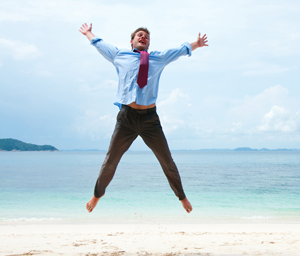 Reward employees with travel incentives. A complimentary trip would inspire me to leave my cubicle! We have a number of options, from 2-night to 7-night getaways, if you’re interested. Don’t guilt employees when they ask for time off or talk negatively about coworkers who are on vacation. Ask human resources to distribute statistics on the health benefits of vacationing. Problem #3: The same survey reported that 61% of vacationing employees ended up doing some work during their time off. This means that vacation time might not be true relaxation time. Provide wider training and backup plans so that employees aren’t forced to be on call 100% of the time. Star employees may be concerned about competition from coworkers, so make sure that this is implemented across the board. This will benefit you if someone suddenly gets sick for a week, too! Help your employees plan for being away, and be gracious and helpful when they return. An employee with support won’t be as concerned about falling behind. We all appreciate these employees, but it’s your job to help them realize that space is healthy. For example, loyalty to your spouse doesn’t mean spending 24 hours a day with him or her. You and your spouse will appreciate each other more and thrive more if you have time to yourselves sometimes. In the same way, when employees spend time away, they come back refreshed and more able to be energetically devoted to their work. Being connected is part of our culture, not just your company’s culture. I admit that I feel like I still have to post on Facebook everything I do on vacation. I think the solution to this is twofaced. One, actively discourage employees to stop. Respond to their email on Saturday morning: “John, why aren’t you in a beach chair right now? I expect a tan. I’m not responding to this until you get back.” And then two, when he gets back, give him a full debrief of what happened when he was away. Really giving your employees the freedom and support to take time off from work requires you to be a proactive and understanding boss, and I think you’ll find that it’s worth the extra effort. Doesn’t every business desire happy employees? To learn more about using travel incentives as part of your marketing strategy, visit www.grandincentives.com, email sales@grandincentives.com or call 941-552-7885.